Scores of people attend Purple Stride. Walkers and runners, clad in purple, hit the oceanfront this morning for Purple Stride. 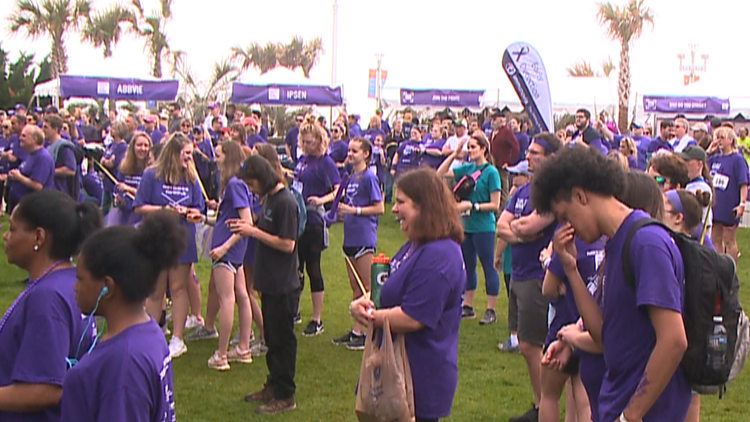 VIRGINIA BEACH, Va. — Friends, families, and survivors came together for Purple Stride, a yearly 5K walk that ended at Neptune's Park on the oceanfront. Wood was just one among scores of others who turned out for the big event Sunday morning. Maggie Walsh with the Pancreatic Cancer Action Network said the 5k helps raise money for research and patient services. It's also about raising awareness. Pancreatic cancer is one of the deadliest. Walsh said the five-year survival rate stands at just nine percent. Survivors said raising money for research through events like this, could help further studies on early detection. “Fight it and you can beat it,” O'Grady said. Purple Stride also gives families an opportunity to honor the loved ones they lost, survivors an opportunity to thank their support systems, and communities a chance to offer hope to those still battling. “Try and live out of the abundance of all the people that are helping you and giving you strength and not out of the scarcity of what the disease can do,” Coster said.